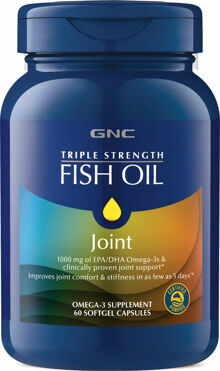 GNC Triple Strength Fish Oil Plus Joint Combines Premium Ingredients That Support Joint Health. 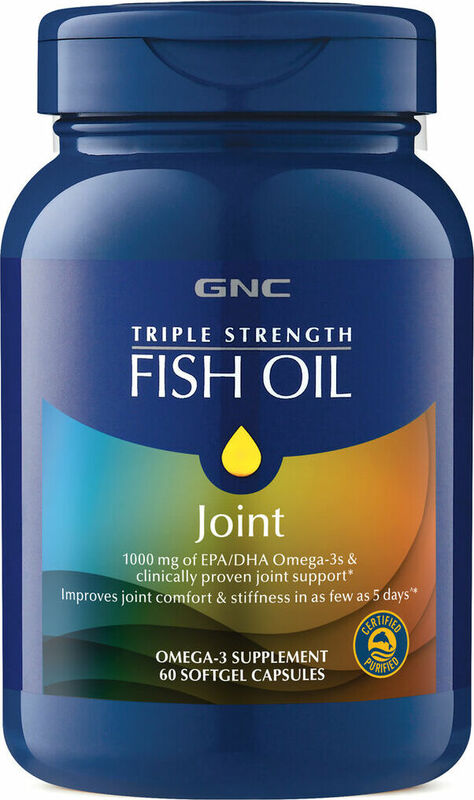 Triple Strength Fish Oil Our Triple Strength Fish Oil Is Packed With Omega-3S, Including EPA, Which Supports Joint Health And The Body's Natural Anti-Inflammatory Response. What's More, EPA Supports Heart And Circulatory Health, As Well As Normal, Healthy Triglyceride And Cholesterol Levels. Omega-3S Also Provide Support For Healthy Vision, Brain Development And Skin Health. Aprflex And Levagen Apflex Is A Potent Boswellia Serrate Extract, Which Is Clinically Proven To Support A 7 Times Greater Improvement In Joint Comfort, As Well As Improvements In Joint Stiffness And Function, In As Few As 5 Days. It Is Thought To Work By Targeting Pathways Related To Your Body's Natural Anti-Inflammatory Response. Levagen Supports A Healthy Response To Inflammation And May Support Comfort.